This level has hard difficulty. 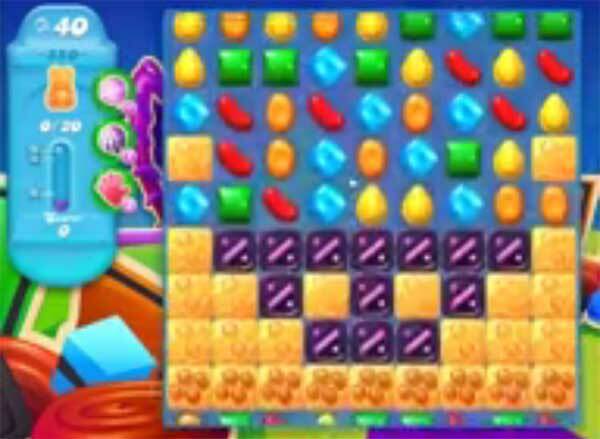 For this level try to play near to blockers and honey or more from bottom as it will shuffle the candies and will give chance to make special candy. Combine special candies with each other to eat more honey. Or play near net to honey to eat them to save the bears. Video won’t open at all! In what universe is this Medium Difficulty? Are you kidding me? Says “Hard level” on my devices. This is bs. I must have played this level 100 times across 3 different devices and haven’t been able to get any more than 15 bears. Bored now. I wish people would post on what they did to complete the level. I am going to do so when I complete the level. I made it through this level on the 2nd day playing. I suggest breaking the barrier on the 1st panel with the first moves and making color bombs, special candies and fish to clear. The bottom layer has no bears. When you get to the 2nd level; your goal is to get the bears in the lower 2 rows. Make vertical striped candies to explode over the honey. Mix vertical and horizontal striped candies with fish to get the bears. If you can make a color bomb or coloring candy, match it to a fish with the most candies of its color on the board. Don’t waste a bomb or coloring candy on regular candies, it may clear candies but doesn’t have the impact to clear the honey. Mixing with striped candies does some good but mixing with the fish works best! I actually made it to #1 on the Leaderboard using these tactics. I watched candycrushmom’s video very carefully, rewinding to catch every move and watched it completely several times to see what worked best. It’s in the video; study it until you understand the reason a move was made. Thank you candycrushmom for your help! I am a novice at this game but after a couple of months I passed it.